(800) 745 3596 to pay your deposit! 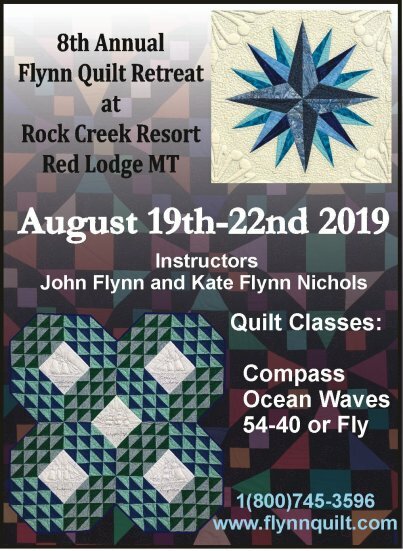 Where: Rock Creek Resort, South of Red Lodge (800)667-1119 A block of rooms has been set aside for quilters. The Resort is about 6 miles from Red Lodge. Class Fee: $325, which includes 6 hours of instruction each day with John Flynn. Kate Flynn Nichols will be assisting John again this year. The class projects will be Ocean Waves, Compass and 54-40 or Fly! Optional pre-cut kits will be available in class. Also included in the class fee are lunches for students and an evening Meal. A $50 deposit holds a place in class and class size is limited to 20. Sewing machines are available for rent. We had fun this year; plan to join us in 2019! Call (800) 745-3596 to reserve a spot and pay your deposit or mail a check with your name, address and email address to the address below. More information on the classes, supply information and maps will be sent when you register. Non quilters can enjoy hiking in the Beartooth Absaroka Wilderness, fishing, rafting, golf, shopping, museums, Yellowstone National Park, to name a few recreational opportunities in the area. COME JOIN US!